In 2011, audiences were shocked upon seeing the surprisingly-great re-imagining, Rise of the Planet of the Apes. Director Rupert Wyatt, and screenwriters/married couple Rick Jaffa and Amanda Silver, delivered a well-conceived story that paid homage to original five-film series throughout. Andy Serkis’ portrayal of Caesar, the leader of the apes, quickly garnered overwhelming praise for its subtlety and believability. By all means, no one expected such a great, modern film with an old, rather ridiculous premise. However, despite little marketing compared to other summer blockbusters, Rise surprised us all with its characters and heart. Now, three years later, Director Matt Reeves (Cloverfield and Let Me In) continues the apes’ tale toward the ultimate endgame in Dawn of the Planet of the Apes. Set ten years after the events of Rise, the film begins with a harrowing, extended version of the credits sequence from its predecessor. The world has been exposed to the Simian Flu, and 80-90% of humanity has been wiped out. The remaining survivors live in quarantined areas. Of course, like with the first film, the narrative never leaves the San Francisco area, so we only see one human colony. 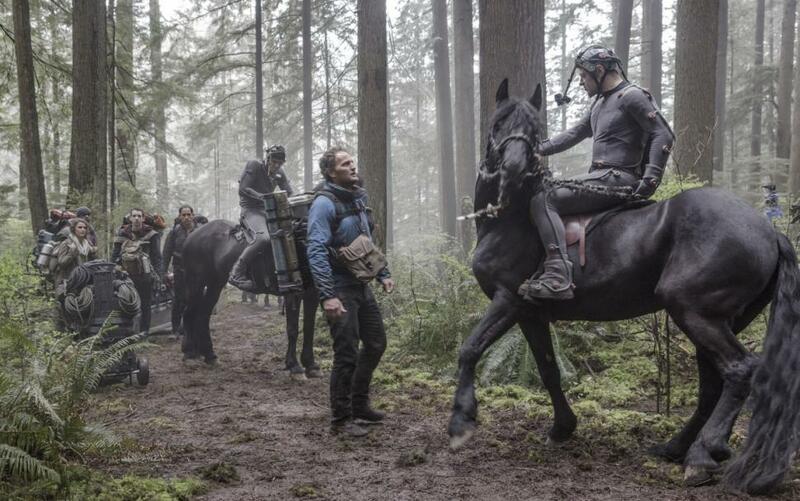 Jason Clarke and Gary Oldman play two leaders who approach the apes in different ways. Despite the star-power behind his name, Oldman really isn’t present that much throughout the movie. Instead, Clarke carries the human side of the story on his shoulders. His character, Malcom, is joined by his family and a few others as they attempt to make peace with the nearby ape colony in order to use a dam within their territory. Keri Russell plays Malcom’s wife, Ellie, and ably communicates just how much the humans have experienced with her ability to summon tears on command. The first film to feature multiple motion-capture actors interacting with nature. With no disrespect intended toward the human characters, the real stars of this film are the apes. In the time between the two films, they have developed a fully-functioning society filled with architecture, aesthetics, soldiers, and education. Of course, Andy Serkis returns, bringing Caesar to life with an eerily-believable performance. He truly makes us see the emotional stress Caesar undergoes as he tries to shepherd his community while also sympathizing with the humans who once allowed him in their world. Let’s just say this: many will cry fowl if Andy Serkis does not receive his due recognition. Besides him, though, other actors brought equally believable turns as the lead apes under Caesar. Reeves smartly decided to include the same apes from Rise, providing a nice sense of continuity and strengthening the bond between them all. Audiences will remember Maurice, the circus orangutan who serves as Caesar’s adviser, or Rocket, the strong chimpanzee who yielded to Caesar in the prequel. Of course, the most stunning retuning ape, besides Caesar, would have to be Koba. This time played by Toby Kebbell, Koba serves as Caesar’s muscle, willingly entering dangerous situations for the greater good. However, throughout the course of the film, Koba’s disdain for humans manifests into some of the most memorable, original actions I have seen in recent cinema. I aim to communicate how amazing Koba’s role is without ruining anything. Spoiling this film would certainly be a crime of some sort. Caesar, Koba, Malcom, and Maurice. 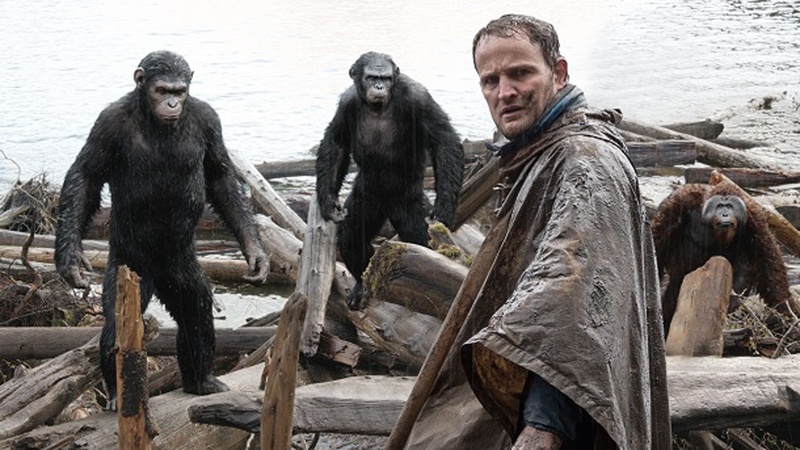 Notice the water effects on the apes’ fur. The performances are not the only aspect of this film to make it stand out as one of the best sequels I have ever seen. Reeves’ direction chose to first illustrate just how similar the apes were to humans with their culture and love for one another. The first fifteen minutes or so feature almost no dialogue, instead showing the ape community live and hunt, only communicating with sign language and grunts amid a beautiful score by Michael Giacchino (Star Trek, Up, Super 8). Speaking of the music, Giacchino knows exactly when to underscore emotional moments with harmonious strings, and when to pay homage to the original 1968 film by using wild xylophones and screw-filled pianos whenever the apes perform certain actions. Additionally, if Rise paid homage to the originals a little too blatantly, Dawn does so in a less in-your-face manner. No one yells Charlton Heston quotes this time, but many set pieces conjure images from his iteration in subtle, tasteful ways. Another feature that deserves its own heap of praise is the cinematography by Michael Seresin. The shots of the apes’ home in the Redwoods are awe-inspiring, making one want to seek out such locations after leaving the theater. Nearly every shot could be framed as a still on a film-buff’s wall. Those who appreciate long shots will go crazy for one sequence in which a tank rolls through a battle with the camera positioned near the hatch, focusing on one character’s actions while revolving 360 degrees multiple times to show the surrounding chaos. Seriously, this continuous shot was one of the most amazing things I can recall having seen in a theater. If the movie were utterly terrible in every regard except this shot, it would still be worth seeing. Thankfully, the whole movie excels in every conceivable way. There’s a reason many are calling it this series’ “Empire Strikes Back.” It logically continues the story of Rise, and capitalizes on it every way: acting, emotion, score, cinematography, story, and theme. They are all top-notch. This film truly has to be one of the best sequels ever made. Considering the fact that “Apes” has never been a franchise to confine itself to a trilogy, we cannot wait to see how many stories can be written to progress this universe. This sentiment only grows stronger since Reeves, Jaffa, and Silver will be returning to helm the next installment. Giacchino’s score truly reflects the original’s chaotic percussion beats and zany xylophone sounds. Jaffa and Silver wrote the screenplay for Jurassic World, and Giacchino will be writing its score. We heavily approve. The future is in good hands. To read about how that production is coming along, click here. We suggest (re)watching Rise before seeing Dawn. Certain things…go down…with great parallels. Maurice may or may not be the coolest character. Friendly orangutans just have some kind of perpetual smile…at least in this series…maybe not real life. Many of the trailers have misdirected viewers from real spoilers. A good percentage of the advertisement footage and audio is not present in the final cut. We like this approach. Ultimately, you should see this movie. I personally cannot wait to see it again.